You must have done something really good, because today you get two delicious rice recipes for the price of one! And they're so economical because one bag of Arborio (short-grained) rice will make you several batches of each (not that I'm suggesting you go on an all-rice diet). So keep some in your pantry, and dinner and dessert will always be rice and easy. I like this recipe from Everyday Food just the way it is with a green salad on the side, but if you want something a little more hearty, you can add chunks of chicken or cooked shrimp to the risotto at the end. And feel free to improvise with other veggies- tomatoes or broccoli would be delicious additions. 2 cans (14.5 oz each) reduced-sodium chicken broth (or you can use vegetable broth if you want to make this vegetarian). 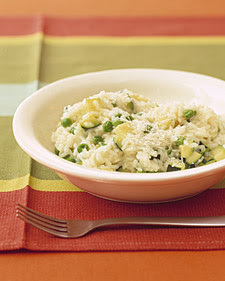 4.Add zucchini and peas; cook until peas are bright green, 2 minutes. Remove from heat. Stir in remaining tablespoon butter and Parmesan. Serve, topped with more cheese. I adapted my recipe by simplifying Emeril's rice pudding recipe a long time ago (I got rid of all the bells and whistles...and raisins), and I like to make a big batch which will keep in the fridge for a week. It is very rich and creamy so a few spoonfuls make a delicious and satisfying dessert that really "rices" to the occasion. In a large saucepan, combine the rice, milk, cream, sugar, and salt. Bring to a simmer, stirring, over medium heat. Reduce the heat slightly to maintain a low simmer and cook uncovered, stirring frequently, until the mixture starts to thicken, about 30 minutes. Continue to cook, stirring occasionally to prevent the rice from sticking, until the spoon is just able to stand up in the pudding, about 5 minutes. Remove from the heat and stir in remaining ingredients. Rice, rice, baby. 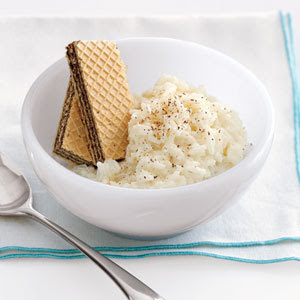 photo credit: risotto: Martha Stewart, rice pudding: Real Simple.